Hanging wreaths on every window (facing the street) of our home was something I’ve always wanted to do for the holidays. This is the first year we are living in a house so I was very excited I finally have the chance to go all out for Christmas. Hanging wreaths is actually much easier than I imagined….as long as you have the right tools. 2.5 inch all weather red ribbon. HERE is the one we used. Remove screen from each window. Make sure you label which screen goes where. Even if screens look like they are the same size you can have issues rehanging if they get mixed up, and that goes double for older homes. I started with the front of the house, lower level and started from 1. Then labeled the upstairs, upper level and also started with 1. Figure out where you want your wreaths to hang. I like them to hang in the upper section of the window, completely centered. I then measured where the suction cup that holds the wreath should go based on the positioning. 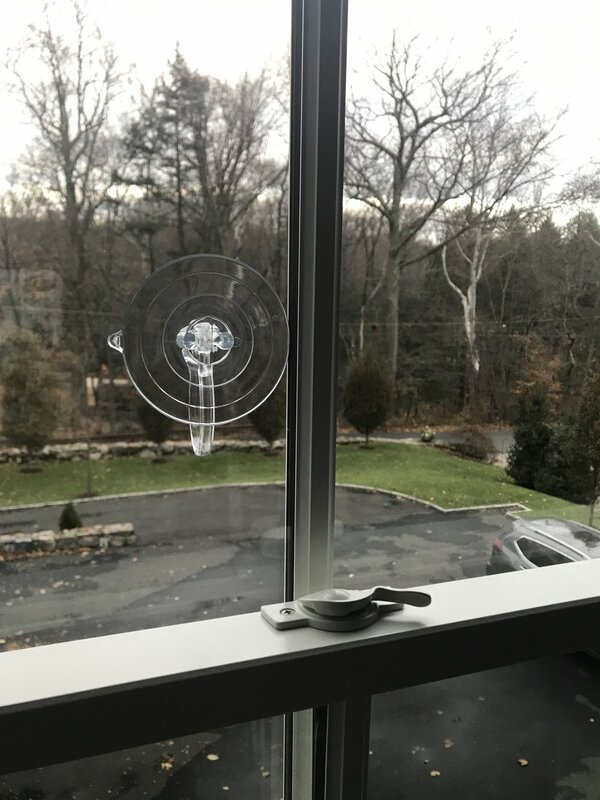 Our suction cup sat 10 inches from the top of the window to the middle of the suction cup. We then placed the suction cup 10.5 inches down the window each time. (We were working through the top of the windows. I pulled the top pane down a few inches and worked from the inside.) Our windows have a wood piece that runs right down the middle so I placed the suction to the right of that molding. Next I measured how much ribbon I would need. I wanted to leave just a small amount so it would fit on the top of the window. I then cut one piece for each window from that first length. After gently positioning the ribbon around the wreath, I had enough excess to secure it to the top of the open window with a push pin before closing the window and locking everything in place. I then placed each one of our candles in the center of our wreaths held up with a mini suction cup. I used clear tape to tape the cord to the wooden part of the windows to try and hide it. I did need a few extension cords for a few rooms. I will place one in the center of each wreath and hopefully they will illuminate the center of the wreath making everything come to life.